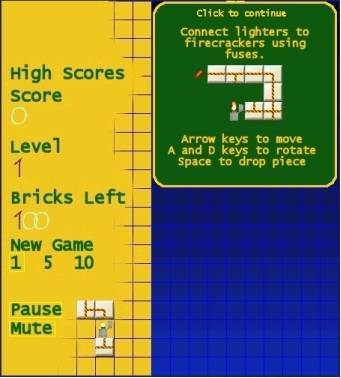 This game featured something like a Tetris style of play but the blocks had rope paths that you had to match the lighter with the fire cracker (or dynamite) to remove blocks. Due to changes in modern browsers this game is no longer likely to run. If I have time I will update it to run on mobile devices or as a downloadable game, because it was a pretty fun little game.